Ecommerce marketplaces have become the new normal when it comes to fulfilling day-to-day shopping requirements. Whenever consumers wish to buy anything – from electronics, clothes to various household items – they prefer to go online. To meet this growing demand for online shopping, a large number of ecommerce marketplaces have come up in recent years. The most important part of a product page, aside from the product description and buy button, is the product image. But just look at different ecommerce marketplaces, and you would likely see the same product pictures everywhere. The fact of the matter is that people always want to see what they’re buying. You could write the best product description in the world, but if there’s the same old or poor quality picture, odds are people would not buy it. So, rather than taking stock images from the manufacturers or seller itself, you need to use professional photographers to photograph the products individually from difficult angles offering a more clear picture of what the consumers are buying. Additionally, nowadays, very few marketplaces focus on optimizing their product images, which is highly crucial when it comes to increasing page loading speed, conversion of your website, and gaining trust of the customers. Visual content is considered one of the crucial elements for conversion, but all you see in that regard is limited to product images. However, when it comes to visual content nothing beats videos. Therefore, as a marketplace owner, you can create a unique identity by showcasing product images along with videos. Studies have shown that website visitors are 64-85% more likely to buy your product after watching a video on the product page. By offering product videos you are not only offering them value in terms of product information but also eventually standing out of the competition. Most ecommerce marketplaces ignore having a blog on their website citing that most of the people come to their website to buy and not to read. However what they do not realize is that having a blog is one of the best ways to market your ecommerce website. You can easily promote certain products using unique content and even stay connected with your audience on latest updates being brought to your website. Having fresh content multiple times a week also gets people returning to your site more than once. It is also helpful, as far as SEO is concerned, in ranking prominently among search engine ranking pages. The bottom line is that nobody wants to pay for shipping when it comes to online shopping. Studies have shown that if you offer an option between discount and free shipping, most of the consumers will opt for free shipping. Infact, when Amazon launched it prime services which offered free shipping on every product, people subscribed to that service in a blink. By offering free shipping you entice consumers in buying from your website and it also helps reduce shopping cart abandonment rate. Some websites add a clause of threshold where consumers are entitled to free shipping only after their cart value is above a particular mark. This is good way to increase average order value of your ecommerce store, while also allowing customers to avail the much desired free shipping. Many ecommerce marketplaces think that their job is done once the sale is made. After that they just forget consumers and their grievances, if any. However, nothing works better with consumers than a good consumer support service.Amazon has been able to become the king of ecommerce only by offering spectacular customer support services. So, it all boils down to how you treat your customers when they’re unhappy with your service. This can literally make a world of difference for you. Even when you sell the same products as your competition, if you provide better after sales support services, they’ll likely buy from you again in the future instead of your competitor. When consumers used to buy products from traditional brick and mortar shops, it was always the connection between the shop owner and the consumer that brought the latter to repeatedly to the former. However, that thing is missing in the online commerce. Almost all ecommerce owners lack a personality when it comes to engaging customers. To stand out when selling the same products as everyone else, you’ll need to add some personality to your website and ensure that the customer does think of you as a big & desirable brand they can rely upon. For instance, add an Easter egg or a funny joke in the description of a product to bring a smile to the customer’s face. Your customers will really appreciate it and most probably come back for more purchases in future. Most consumers look for review before buying a product.So when an online marketplace does not have any reviews, it depicts that people will not trust buying from it. The more reviews your website has the more likely your customers will buy from you since you’ll look more popular& trusted. Also, make sure you remind your existing customers to write reviewsfor the productsthey buy. You can also open the review system to visitors who have bought the product from some other website or brick and mortar store. Adding videos and images of the product in reviews can also be beneficial. If you and your competitors are selling the same mobile phone, the only way to beat the competitor and to ensure that consumers choose you, is to sell it at a lesser price. If you cannot beat them on prices, keep it competitive and offer discounts and offers to consumers. When the product sold by you and your competitor is same, you can gain an edge by enhancing the shopping experience. It is generally said that ‘with ecommerce becoming the norm of our social lives, people have started to value the experience rather than the product itself’; obviously as the latter is commonly available at multiple websites. The same strategy has been used by traditional retailers for a long period of time to entice customers. 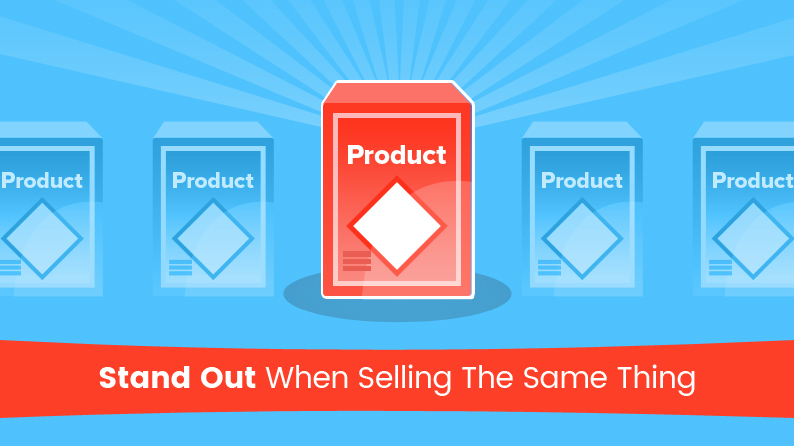 One of the most effective ways to stand out when selling the same products as everyone else is providing a great product selection by having a mix of both drop shipped goods and exclusive products. When customers buyexclusive products from your website, the second time when they opt for a drop shipped product they most definitely will choose your website again over the competition. What most ecommerce marketplace owners fail to understand is that having a robust backend system with all the crucial consumer centric features will definitely offer better user experience. Consider you are visiting two traditional retail shops with same products. In one shop specific shopping aisles are not marked and it takes time to find a product. Also during checkout, the person accepting the payment looks shady and the transaction also does not process well.Now in the second shop, everything is placed properly and you find the product you are looking for with ease. At the payment counter your transaction goes through seamlessly and you are back in your car within no time. You also get a thank you note after leaving the store. It is obvious that next time you plan on shopping; you will most definitely choose the second store for products. The same holds true for online marketplaces, which need to have a robust platform, so the entire shopping experience can be streamlined for customers. 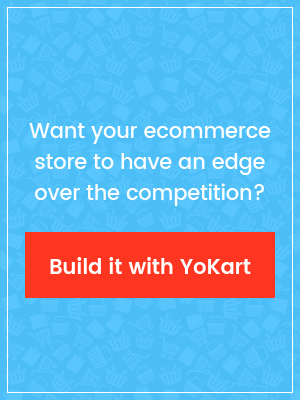 YoKart is one such platform that has been powering ecommerce marketplaces all across the globe. It has all the necessary features required in a consumer-friendly ecommerce marketplace. In the current market dynamics where competition is high, having these features will greatly help you in having an edge over the competition and eventually capture the market.